The GOP is pushing a bill that would force doctors to provide life-saving care to babies who survive abortions. The Born-Alive Abortion Survivors Protection Act failed in the Senate after only three Democrats crossed the aisle to support it, falling short of the 60-vote threshold. The Democrat-controlled House has blocked a similar bill from even coming to a floor vote, leading congressional Republicans to launch a discharge petition to rescue it from dying in committee. 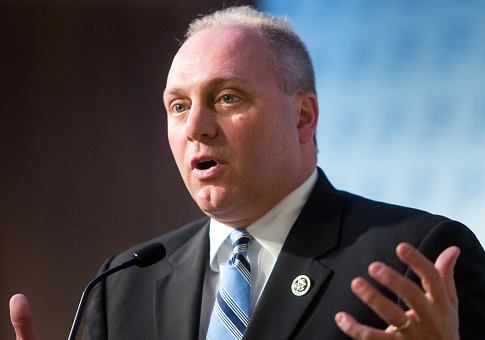 GOP whip Rep. Steve Scalise (R., La.) is spearheading the petition drive. His outreach effort to Democrats, however, has only yielded three signatures—putting him 18 votes short of getting the bill out of the Judiciary Committee. Scalise said Democrats will not be able to dodge the issue. "I hope they recognize that the country is paying attention now," he said. Late-term abortion gained national attention after New York adopted a bill that allows abortion up until the point of birth and prevents people accused of murdering pregnant women for being charged with the death of the unborn baby. The debate over the issue reached its peak when Virginia Democrat governor Ralph Northam, a career physician, defended allowing a newborn to die on the table unless the mother approved of resuscitation. Scalise said lawmakers will have to answer for their failure to act on the bill, even if they do not actively vote against it. Blocking the discharge position, he said, is tantamount to a vote in favor of infanticide. "You can't go home and explain that you support the murder of babies born alive," he said. The Born Alive Act has been informative for voters, according to Terry Schilling, executive director of the American Principles Project. Democrats' intransigence in the House, as well as active opposition from all of the party's declared 2020 nominees, could hurt it's appeal to voters, both moderates and a good portion of the party base. A vast majority of Americans, including 70 percent of Democrats, support providing care for babies who survive abortion. "This legislation puts teeth into enforcement so doctors can no longer get away with infanticide," Schilling said. "If I'm a campaign manager for a Democrat facing a tough race, I'm saying to him that this is an easy call." Scalise said he has been making a similar pitch to his colleagues. Their vote—or lack thereof—on the bill "is going to come back" to haunt them if they do not get on board with protecting newborns. Blocking it is a "radical position" that could threaten the newly minted Democrat majority in the House, according to Scalise. "It shocks people," he said. "I think a lot of swing voters who moved toward Democrats in the last election will look at this issue." The discharge petition needs 218 votes to bring the bill to a full floor vote. It has received 198 signatures as of Friday. Representatives Dan Lipinski (D., Ill.), Collin Peterson (D., Minn.), and Ben McAdams (D., Utah) are the only Democrats who have supported the measure.